Is that Bobby Prince I hear? 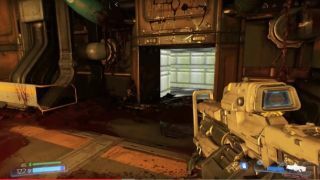 We got a good eyeful of Doom's single-player campaign yesterday, courtesy of id Software's Marty Stratton and Hugo Martin, who streamed some quality solo demon-killing action on Twitch. But IGN gets credit for revealing the big secret of the day, which is actually really cool—and which, for the purposes of spoiler protection, you'll have to look down to discover. It's Doom in Doom! Original Doom, retro-Doom, Doom Classic, whatever you want to call it: There are “stubs” of maps from Doom and Doom 2 stashed throughout the upcoming reboot. They're not full levels, but the layouts and textures will be identical to those in the original games, and finding them will unlock the full version the map, which will be accessible from the main menu. Doom will be out on May 13.